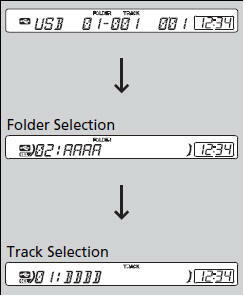 Your audio system reads and plays sound files on a USB flash drive in either MP3, WMA or AAC*1 format. Connect your USB flash drive to the USB adapter cable, then press the AUX button. *1:Only AAC format files recorded with iTunes® are playable on this unit. list of files in that folder.